Although the name suggests that the primary use is trekking, I've been using the Nosi Trek sock from Craghoppers for a variety of walking over the summer months here in the UK. And they've been very comfortable - the padding kept my feet comfortable, they stayed in place well and the wicking was excellent. The only downside was that I didn't think that the odour management was that great at least compared to some of my other walking socks. Fortunately the Nosi Trek socks washed fine and dried very quickly. I wasn't walking in particularly insect-ridden areas - so haven't really been able to test out the insect repellancy. 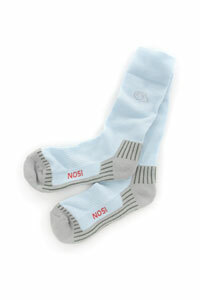 Overall the Craghoppers Nosi Trek socks are a good, general use sock for a variety of summer walking. They wick well and are a good length for higher cut walking boots.